Faculty member Paul Hemsley adjusts the video screen so his AP Biology students at Bishop Grimes Junior/Senior High School can share a lesson with students at Rome Catholic School. 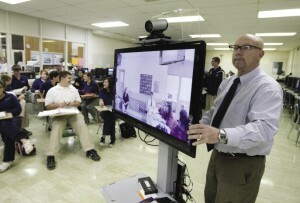 This fall as bells rang though the halls of Rome Catholic School (RCS) and Bishop Grimes Junior/Senior High School in E. Syracuse, a new era of innovative learning began — distance learning via video-conferencing. The concept of distance learning is not new, but advancements in technological media and the desire to expand curriculums on tighter school budgets make distance learning a vital teaching tool for 21st Century Catholic schools. The birth of distance learning dates back to the mid to late 1700s, where instructors communicated simple and practical lessons through the mail, allowing students to gain valuable job skills away from major centers of education. Today’s distance learning models are tailored after university programs originally implemented for students off-campus, and some colleges and universities have been founded on the sole premise of distance learning to accommodate the growing adult student populations. Barbara Jacques, principal of RCS, attended a Cyber Symposium in 2008 sponsored by Cyber Innovation Center in Shreveport, La., where school systems across the country, both public and parochial, attended to share Cyber Security applications. Jacques and RCS technology instructors Sandra Engle and Thomas Potter pursued the vision of distance learning within the Syracuse Diocese. 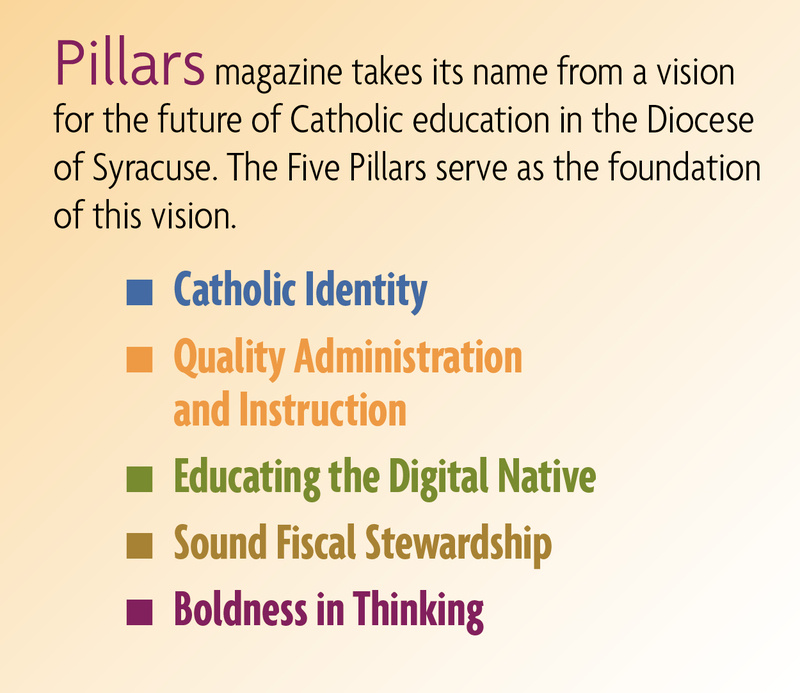 Because the resources necessary to purchase the technology were funded through the Diocese of Syracuse Heritage Program Enhancement Grants, the partnership with RCS and Bishop Grimes High School, 50 miles down the New York State Thruway in Syracuse, became a reality. Distance learning via video-conferencing technology is made possible by the use of two units made by Tandberg equipped with a Precision HD camera and HDTV with tuner on a LX video conferencing cart. RCS already had a unit thanks to a 2007 New York State Learning Technology Grant and authored a Heritage grant in November 2008 to purchase the $12,200 sister unit with Bishop Grimes. RCS and Bishop Grimes successfully launched their distance learning courses, but the initial set up took hours of testing. A preliminary test in the spring of 2009 was conducted to verify the feasibility of offering distance learning courses by fall and involved four students from Bishop Grimes and RCS’s Technology Integration Specialist Sandra Engle. Engle installed the software, created a web site and set up student e-mail accounts and feedback modules, and the groundwork was laid for building a system of communication and utilization of technical support. Full integration between buildings began last August with a faculty project manager assigned for each school to communicate the installation of the units and report any technical difficulties. Gates uses a traditional textbook and a Power Point presentation for class lectures. Again, students at Bishop Grimes follow along with the students in Rome by visually seeing Gates through the Precision HD camera and interact through the HDTV tuner, much like a telephone conference call. Bishop Grimes students take quizzes, tests and receive feedback via e-mail. Lectures can be filmed and posted online for absentee students or on snow days. Although the distancing learning program between the two schools is a success, there is a wish list of enhancements, explained RCS’s Potter. “We are looking into enhancing the visual and audio components by adding multiple monitors and dual video systems,” he said. Gates also is investigating the possibility of incorporating the Angel Learning Network for distancing learning on-line test taking.